It’s hard to ignore the irony. 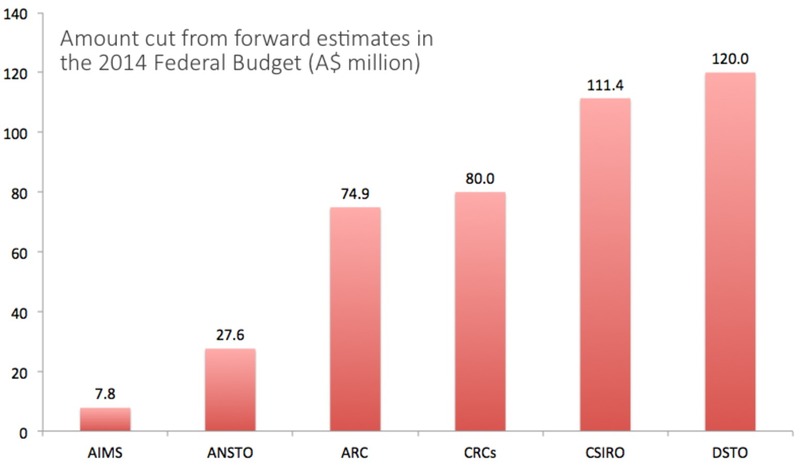 The 2014 federal budget will “better target innovation and research funding to areas of national and strategic priority” but funding cuts of more than A$111 million to CSIRO – the federal government agency for scientific research – have today resulted in up to 420 jobs to go by mid-2015 and possibly a further 80 in the years following. This time last year I wrote about how the government funnelled money from the university sector to fund schools, and now the government has generously arranged for the sick and infirm to subsidise a new future fund for medical research to the tune of A$5 out of each A$7 co-payment when they visit their doctor, or get a prescription. Australian Institute of Marine Science (AIMS). Funding for the Cooperative Research Centre (CRC) program – which supports research collaborations across disciplines and industry sectors – will also be cut. I might add that the cuts are typically reported in absolute dollars and as such tell you nothing about the impact. National ICT Australia (NICTA) will have two more years of government funding before it must find its own investors. Of course, other changes such as charging fees for PhD students will put direct pressure on shrunken university budgets and indirect pressure on individual research budgets for researchers like me who are lucky enough to hold ARC funding. While deregulating university fees may seem like a way of introducing competition, there is little evidence that the Group of Eight universities really do a better job of preparing students – especially undergraduates. The success rate for the primary ARC Discovery Project grant program is already only around one in five. Many of the “failures” represent very good and useful science. As with the unemployment rate, this rate does not take into account those who have already stopped trying. The rate is now sure to drop further. Budgets come and budgets go. The 2014 federal budget, intrusive and destructive as it may be, will be no exception. At least for the moderately well-to-do, economic, personal and intellectual life will for the most part go on, but think of the opportunities lost when, by international standards, Australia’s debt and unemployment levels are far from alarming. I studied in Oxford in the 1970s (during the UK miner’s strikes and three day weeks) and worked at Carnegie-Mellon in Pittsburgh during the early 1980s' Reagan recession (when the mortgage rate for my house peaked at 22%). I worked at Waterloo, Ontario, during the Rae days of the early 1990s Ontario recession, and I spent a long time at Dalhousie in Halifax Nova Scotia in Maritime Canada – an area wealthy in the 19th century – where the good times look worse than any low point seen in Australia since World War II. These represented experience of real crises, if perhaps avoidable ones, unlike the hyperbole-driven Hockey-Abbott budget unveiled last night. Tony Abbott likes to talk about the profligate sins of paying on a credit card, but he should be talking about the flinty virtues of taking out a loan for his grandchildren’s future. I know from experience – as a grant administrator for Canada’s Natural Sciences and Engineering Research Council (NSERC) and National Research Council (NRC), the US National Science Foundation (NSF) and North Atlantic Treaty Organisation (NATO) among other bodies – that any lower grant success rate than at present replaces measured assessment with a lottery. This destroys most of the value of peer review while alienating almost all scientists in the process – and all researchers need long-term stability to undertake anything ambitious and path-breaking. Suppose one grants the current government the dubious assertion that medical research is so much more important than, say, marine science or astrophysics. It is still worth remembering that basic science leads to medical breakthroughs. 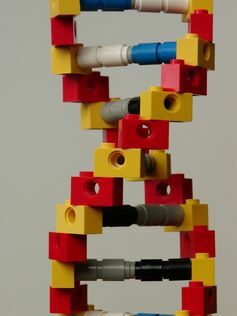 Think of Watson and Crick’s discovery of DNA structure, medical imaging, the treatment of HIV/AIDS, the Human Genome Project. Not one of such projects relied on funding only directly from medical research councils. It is sadly ironic that the current government’s disavowal of global warming and attacks on related research are certain to substantially increase our medical bills down the road. Diseases will migrate, crop yields will change and so on. If 80% of doctors recommend a course of treatment for Joe Hockey, he would follow their advice. When 97% of climate scientists do likewise for the environment, Tony Abbott knows better. Above all, knowledge diffusion depends on a country’s ability to mobilise financing as well as institutions that encourage large-scale investment in education and training of the population while guaranteeing a stable legal framework that various economic actors can reliably count on. In essence, all these countries financed the necessary investments in physical capital and, even more, in human capital, which the latest research holds to be the key to long-term growth. It is a pity that the current Australian government does not understand this message. Jonathan Borwein Jonathan Borwein is Laureate Professor of Mathematics at The University of Newcastle.